My younger son, Name Visible on Login has completed his Masters. He is amiable,friendly and down to earth. He is good looking handsome . 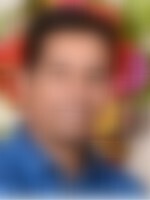 He had his Education in Chennai (B E - EEE )and Montreal, Canada (Masters Electrical & Computer Engineering ).Presently working as Technical Consultant(e-Business Products Development) in Toronto, Canada. Elder son is MS Eng, employed in Canada and is married. Ours is a nuclear family (2 sons, wife Vidya (step mother of our children) and self. Usha (mother of my children) passed away in the year 1999. Our nativity is Tanjore dt. Myself born with 2 brothers and 5 sisters, all well settled in Bangalore, Myladuthurai and Chennai. Name Visible on Login is much caring, affectionate person. He has got balanced progressive outlook towards traditional and modern values. His likes / hobbies are: Billiards,Carom, Chess , Skiing, Music, Travel and cooking. Looking forward to have a good looking, understanding, accommodating, professional and likes to be... more employed bride from a decent family. I am not a paid member, kindly contact me in my registered mobile no. Ours is an upper middle class, nuclear family with moderate values. His father is a working professional while his mother is a homemaker. He has one brother, who is married.